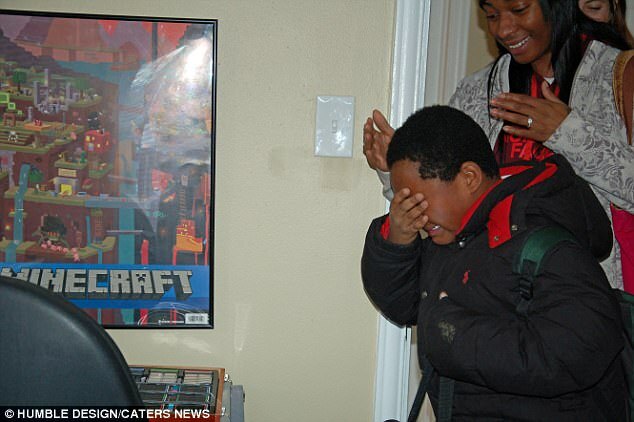 A homeless boy from Detroit, Michigan, had his Christmas wish come true, when his family was able to move into a fully furnished home that, much to his delight, included a bed of his own. Daeyers and his mother Dionna had been living in and out of homeless shelters after she lost her job as a trainee nurse. According to the Daily Mail, when the mother and son moved into state housing, all they had to live with were an inflatable mattress and a few chairs, meaning the eight-year-old slept on a pile of blankets on the floor. With the help of non-profit Humble Design, an organization “helping families transitioning out of homeless shelters by providing furnishings and design services,” Daeyers and his mom were able to celebrate Christmas in a fully furnished home that included the only gift the little boy hoped to receive—his own bed. On December 20, the Humble Design team welcomed the family home and caught the emotional house tour on video. While Daeyers was excited about every room in the house, he was brought to tears when he realized he would not just have a bed—but an entire room—to call his own. It is difficult to imagine that in 2018 there are children like Daeyers living in the United States, wishing for nothing more than a warm bed to sleep in, and as the Daily Mail reported, Humble Design helped 169 families in 2017 alone transition out of homeless and abuse shelters.